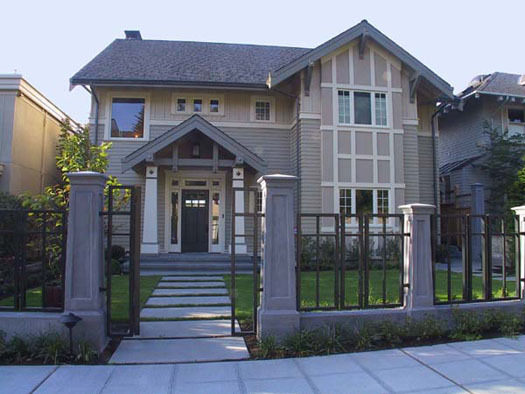 Streetside entrance of a new Craftsman-style home on the south slope of Queen Anne. 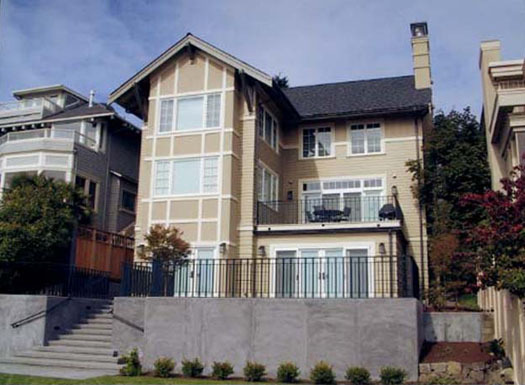 The lot on the south slope of Queen Anne enjoys spectacular unobstructed views of Elliott Bay, Downtown and the Space Needle, West Seattle, and Mount Rainer. The sloping site had a small brick house on it that did not have the size or siting to make it worth remodeling. Demolish an existing house and replace it with a five-bedroom Craftsman style house, with as many rooms in the house as possible to have views. Main level was to include a formal entry, formal dining room, kitchen on the view side, and a family room adjacent to the living room. Upper level was to include three children’s bedrooms, two children’s baths, a laundry, and a master suite. Lower level was to include a laundry/sewing room, an entertainment room with an adjacent kitchenette and informal dining area, a guest suite, and a home office. The yards were to be fenced in for the safety of small children playing. The back yard was be terraced, with a patio off of the lower-level view rooms and a lower grass yard placed on top of a new two-car underground garage. Designed proportions, structural elements, and all interior and exterior detailing — including concrete posts — in the Craftsman style. 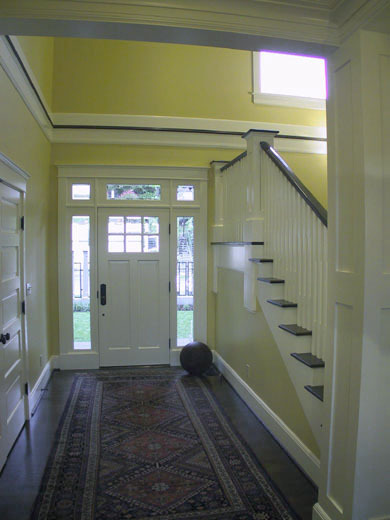 Created distinctive Craftsman style formal entry with a two-level stairway and overlook hallway. Provided sweeping views from living and family rooms, home office, kitchen, master bedroom, master bath, and two of the children’s bedrooms. Coordinated interior and exterior colors with a subdued but rich autumn palette. 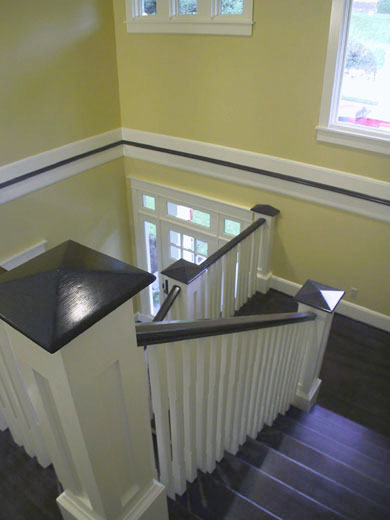 Flooring throughout is dark-stained oak. 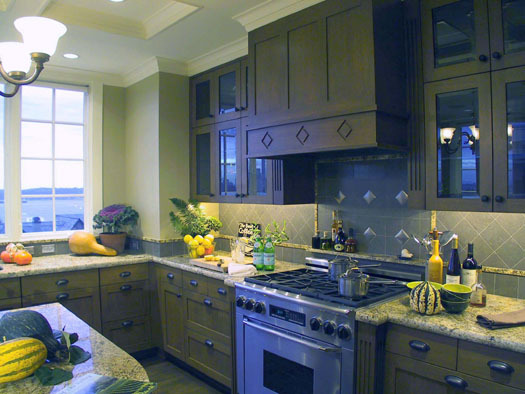 Kitchen and bathroom surfaces include granite and limestone, as well as accents of pewter tile. 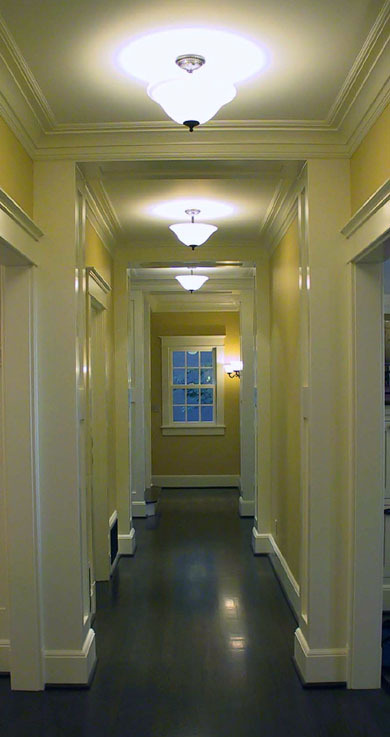 Lighting is a mix of traditional Craftsman fixtures and low and line voltage recessed lights. Implemented high-efficiency mechanical system using hydronic forced air system for space heat and hot water. View from terraced backyard showing windows overlooking Elliott Bay. 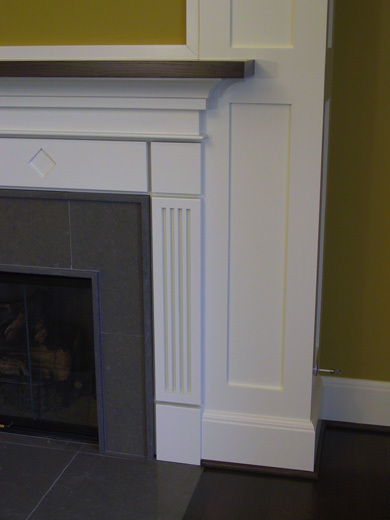 Living room fireplace detail with limestone surround and hearth, casework, and oak mantelpiece. 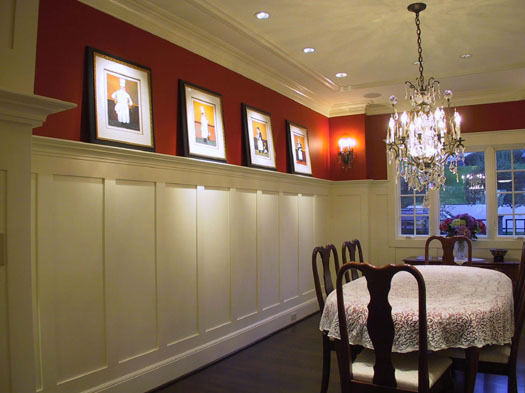 View of dining room showing built-in china cabinets. 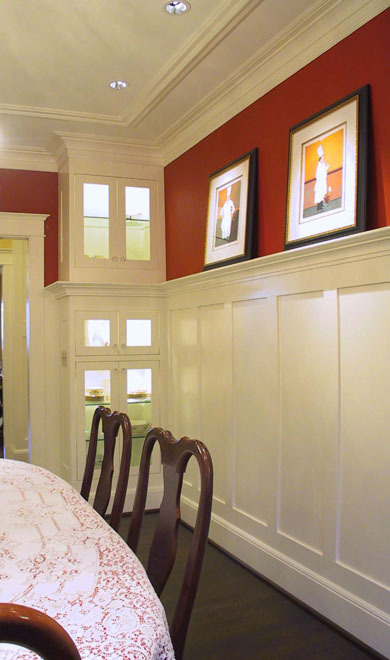 View of dining room showing Craftsman details such as plate-rail wainscot to display art, and built-up crown molding. 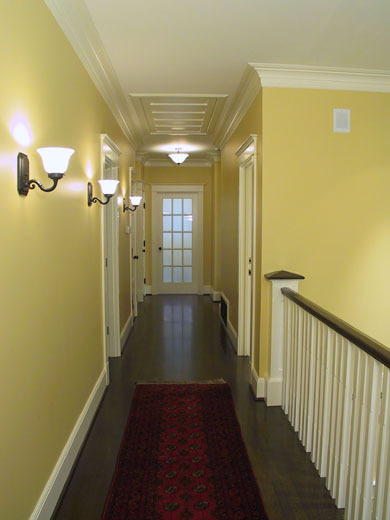 Main hallway on the first floor. 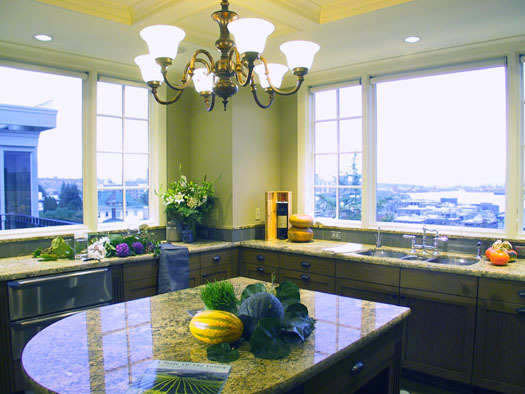 Kitchen with granite counters and coffered ceiling, looking southeast toward Downtown. Gas range with custom vent hood and limestone backsplash incorporating granite and pewter accents. Stairway, looking down from the upstairs landing. 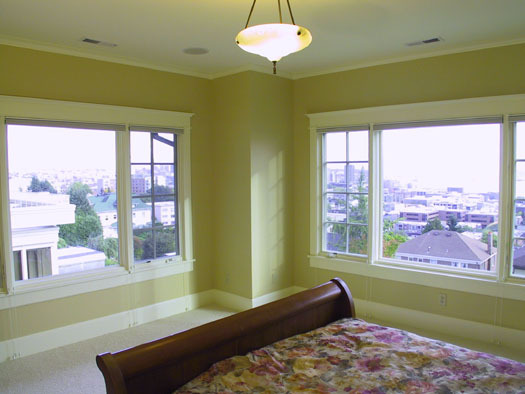 Master bedroom with southeast view and detailed replicas of Craftsman style windows. 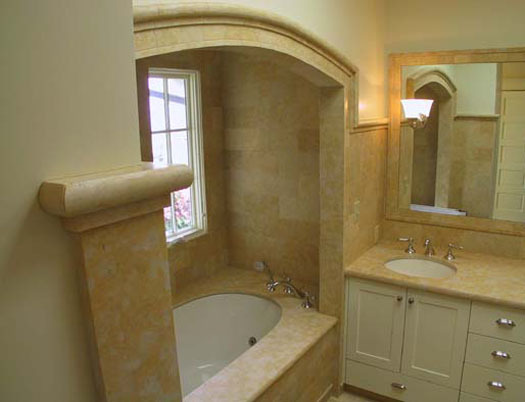 Jetted tub in the master bath finished with limestone slab and tile. Window offers a peek-a-boo view of Elliott Bay. 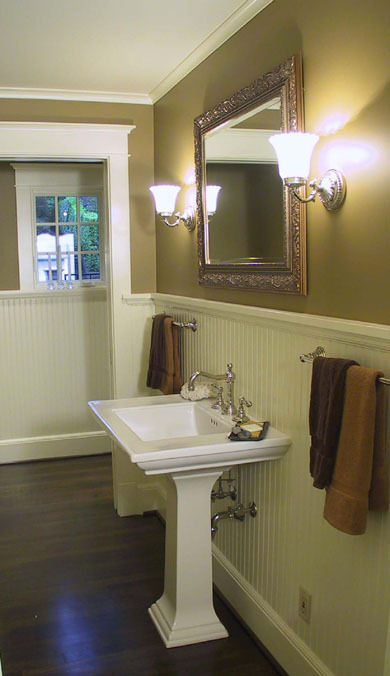 Powder room with bead-board wainscot and period style fixtures. 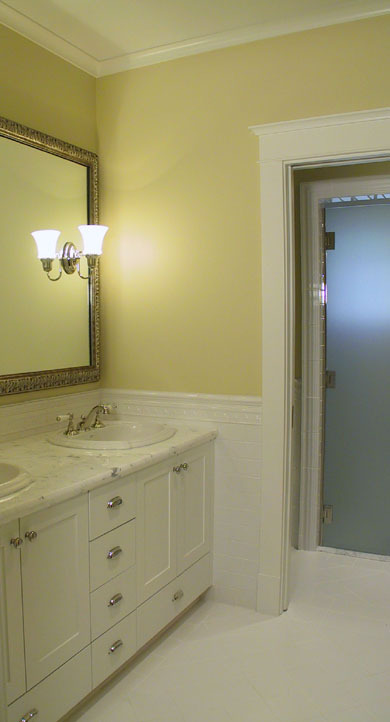 Children’s bathroom showing detailed tile wainscot and a marble countertop.